With less than two weeks remaining of the U20 youth international basketball pre-season Turkey are making a claim to be one of the favourites to win the 2013 FIBA Europe U20 European Championship for Women Division A. They beat Russia (64-56) in their final match to complete a perfect weekend with three wins from three games. In the last match of the competition Spain edged out France (59-53) to take second place. France with one victory for the weekend had to settle for third place. For Russia the weekend has been tough with no victories. However in each match they showed signs of improvements and remain one of the favourites for the title because they have some of the best defensive players in this age group. Turkey have been a revelation in this tournament. Each game was different. The Russian defensive system gave them problems and for the first time in this tournament the offensive duties were more evenly distributed. Turkey will conclude their preparation in a three-team tournament with France and Spain in the week before the European championships. The 1993 generations of players from France and Spain know each other well because they have played against each other every summer since 2008. In their latest encounter it was Spain that got the win (59-53). Astou Ndour (left in picture) from Spain was unstoppable. She finished with 21 points. France could do nothing to stop her winning all the rebounds. Spain won the first quarter (17-11) which was enough for them to hold on to victory. The remaining three quarters were evenly matched. 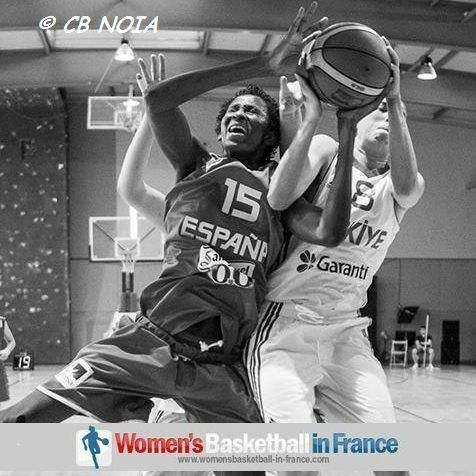 Romane Bernies and Christelle Diallo were the leading scorers for France with 9 points each while Marie-Bernadette Mbuyamba and Sara Chevaugeon followed up with 8 and 7 points respectively. For Spain Elena de Alfredo backed up Ndour with 12 points.